The third Tuesday every month, the men meet at 6 p.m. in the Fellowship Hall for discussion of upcoming events, a devotional time, a meal and a speaker. The men of the church lead our mission trips and Disaster Response Teams, providing help throughout the country. They have also participated in trips to our sister church in Szeged, Hungary and the Mi Refugio mission in Guatemala. 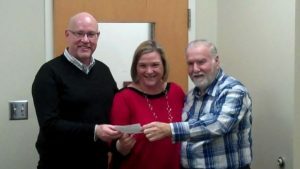 Locally they also coordinate the Good Samaritan program, helping local individuals with small home repair jobs. And the UMM are well known for their peanuts. See the A Nutty Idea page for more info. 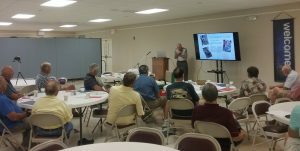 June meeting presentation by Scott Walters of Mobility Worldwide…..providing mobility carts to the disabled, worldwide.